Just because the holidays are over doesn’t mean you have to say good-bye to that sweet treat you crave. With this Six-Ingredient Flourless Almond Butter Cookie you can still get that fix without the guilt – even for those of us with healthier new year’s resolutions. 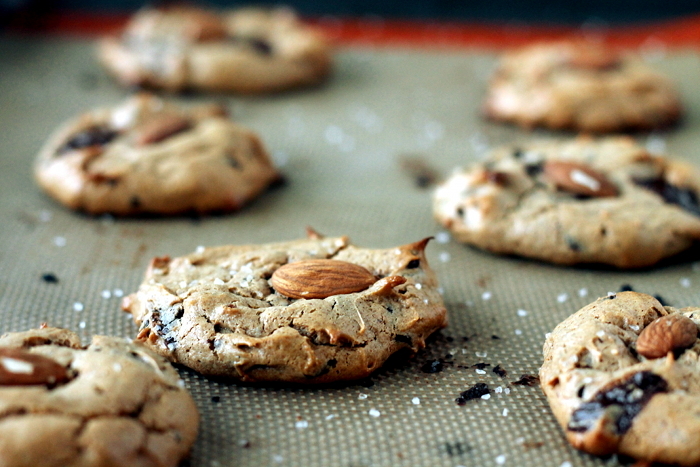 These cookies are – dare I say it for over-exaggeration – pillowy soft bites of flourless heaven. Even for those of us who can tolerate gluten or wheat these would be a healthier and lighter version of your favourite cookies without the heavy ingredient list that slows you down. After eating an array of goodies over the holidays I can understand that we’re all on the track back to healthy eating – but nobody’s perfect. 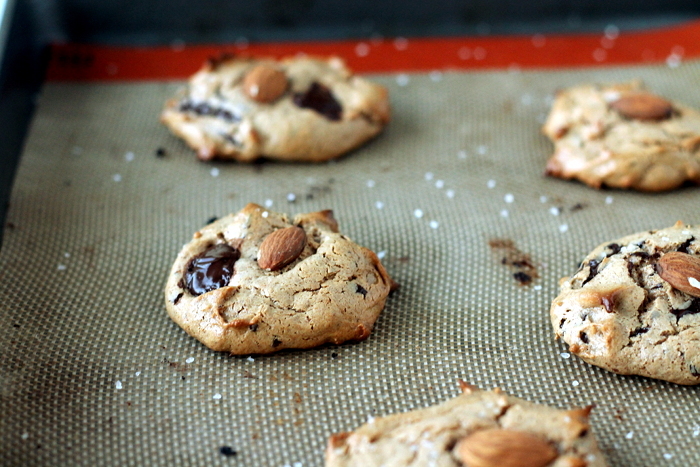 So when the craving kicks in for something sweet try making a batch of these cookies instead of the usual. You can swap peanut butter if you like too – just make sure it’s natural and not creamy or whipped (they have lots of confectioners sugar and other unnecessary ingredients). 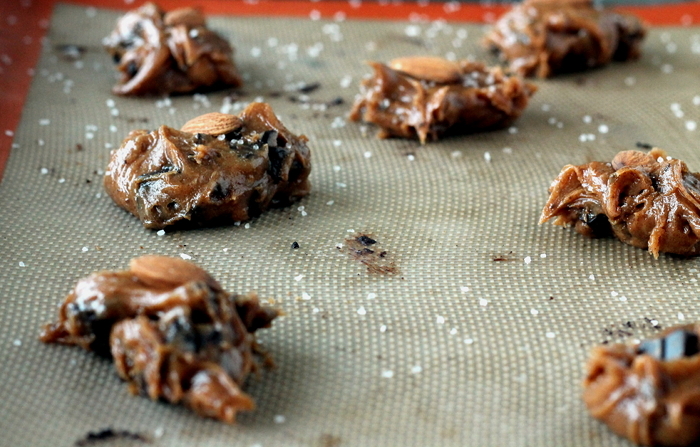 With only a few simple ingredients you can feel better about snacking on one…or two. I say they are pillowy-soft because they are. The outside is almost like a meringue, light and shiny with a dense chewy center reminiscent of a macaroon. You could even leave out the chocolate and add-in chopped almonds or nuts. You can skip the sea-salt too if you like. They are amazing both straight out of the oven, or the next day when the chocolate has hardened and had time to rest. Pre-Heat oven to 350 Degrees. Line baking sheet with parchment paper or baking mat (strongly suggested). In a stand mixer combine Almond Butter and Honey with Egg. Beat until combined, scraping down bowl. Add in Baking Soda – continue to mix two to three minutes on medium-low. The dough will begin to thicken, it will be sticky. Mix in by hand with spatula the Chopped Dark Chocolate, and/or chopped nuts. Scoop and drop using small ice-cream scoop or teaspoon onto baking sheet about two inches apart – they will be more of a free-form cookie in a slight ball shape. You only want a small amount of batter as they will puff/spread. 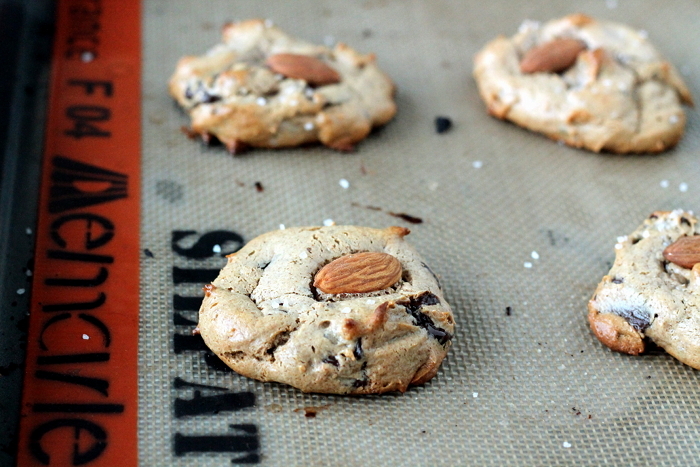 Sprinkle with sea salt if desired, and top with an almond. Bake for 10 to 12 minutes until browned, they will puff up. Cool on baking sheet.